005: Comic Books; fun to read…horrible to make. I can still remember the moment I fell in love with comics. I was about eight or so and had just come back from the corner store with my grandma. Since I was a spoiled child, I had gotten a comic book while there (and also since I was a fat child, probably a few chocolate bars as well). Now, it wasn’t my first comic book (and lord knows it was very far from my last) but for some reason this one changed me. So what’s the comic you ask? It was Fright Night #5 published by Now Comics. 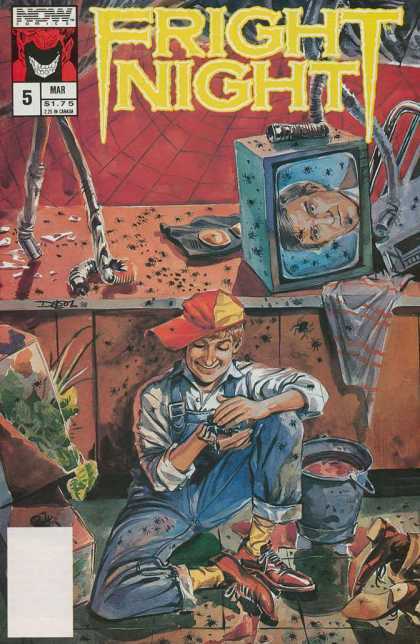 Basically it was a comic series based off the rad 80’s vampire movie of the same name. The comic was set after the movie and it followed the main characters as they hunted various monsters. Anyway, this book was unlike anything I had ever read before in a comic, it was dark and violent and great.